For all intents and purposes, Eighth Grade doesn’t stick out for any one particular reason as it could easily be described as a millennial’s most accurate coming of age story, but that would be to dismiss all the small, but vital attributes (LeBron James!) that make its heart beat in earnest. For example, did anyone else who’s pretty far removed from the middle school/junior high experience forget how anxiety-inducing it was when you went to a friend’s birthday party and had to wait on them to open presents all the while hoping that your present will be deemed cool not only by the birthday girl or boy, but by everyone else in attendance? Yeah, me too, but Eighth Grade does a beautifully haunting job of capturing such an experience in all its dreaded glory. First time writer/director Burnham packs so much into each and every shot. There are so many layers happening, so many things going on, and the majesty of Kayla’s audio from one of her YouTube clips playing over the visuals of her walking into the token popular girl’s birthday party (a party she was only invited to because the girl’s mom knows Kayla’s dad and made her invite her, but ultimately seems a little disappointed when her dad doesn’t come with her) as Anna Meredith’s effervescent score (which expertly and consistently adds to the humor of the piece) pulses underneath culminating in an orchestra of anxiety that perfectly encapsulates what Burnham is going for. He’s going for the cringe factor in all its open and honest magnificence and he finely tunes every minute of his 93-minute feature to this frequency of completely cringe-inducing but wholly endearing. We know because most of us have been there and we hold equal amounts of fear for how the world might react to something not up to its societal standards as we hope that the world will embrace this precious soul whose biggest goal in life is to exude more confidence. A confidence she knows she already possesses, but has to convince others of. 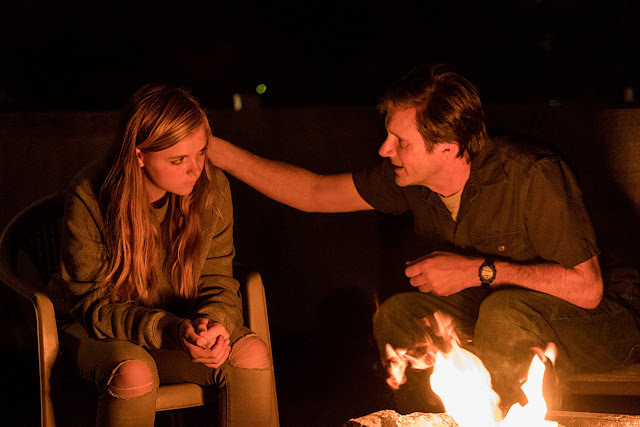 Kayla (Elsie Fisher) and her dad (Josh Hamiilton) share a moment together. One can’t say enough good things about Fisher in her lead role either. She fearlessly exposes her face, fresh with real teenage acne, to the big screen as well as her adorably crooked teeth that lend her a smile that will have you tearing up by the end of it. Her walk is more than perfect and not a false note is played. The “umms”, the “likes”, and the pauses all feel natural. Not to mention, she has some fantastic comic timing. In a scene where she comes face to face with her crush, Aiden (a hilariously aloof Luke Prael), for the first time her reaction to the realization of what was happening around her was laugh-out-loud funny. Belly-laugh inducing, even. The same goes for Hamilton’s Mark who is nothing short of fantastic. Hamilton is saddled with what is the movie’s most “movie-like” moment in a big speech he has to deliver in the film’s final act and it is nothing short of the definition of purity. Also of note is Emily Robinson as a high schooler who Kayla shadows one day as the film takes place during Kayla's final week of eighth grade. Robinson’s Olivia is so positive and encouraging it almost feels as if Burnham is trying a little too hard to upend expectations, but what Olivia is able to offer Kayla is priceless and the bond they form, as surface-level as it might be, along with the wonderful chemistry Fisher and Hamilton have with one another only serve the truly moving nature of the film overall. 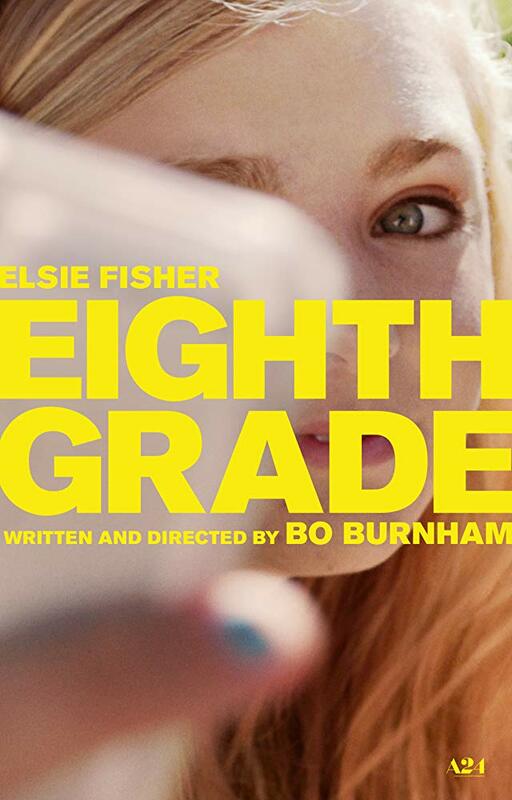 The real magic of Eighth Grade though is how it so effortlessly and in such an understated fashion combines these really dark truths with the irreverence of how we feel day to day. How we all kind of naturally feel these individual days won’t really impact our overall lives or add up to much and yet the broad strokes of what certain periods of our lives amount to or are marked by come from these small, individual moments that could happen on any given day. Burnham is smart in addressing the likes of the effects of social media in our everyday lives, the hyper-awareness of it all, and how it can lead to lowly lows as much as it can manufacture certain highs. The joy Kayla gets out of taking a new Instagram profile pic is a certain kind of high and Burnham captures the optimism that comes with being able to set a new, flattering picture of yourself as the reference point for how everyone you know will recognize you online in a beyond genuine fashion. That doesn’t mean he shies away from the meaner aspects of junior high though, as Burnham works in the normality of school shootings without making it a focal point and while the movie never feels mean-spirited and very clearly loves its characters it never gives them a pass either. In a world where people are always buried in their phones and feelings are both heightened and accelerated due to that hyper-awareness combined with the fact you’re already at a point where things are always awkward, feelings mostly consist of being insecure, and you’re just trying to figure out exactly who you want to be this environment of extreme consciousness can only be helpful in a limited number of ways, but can detract in countless scenarios.